Last day of August. Football is coming. My absolute favorite time of year. The first UMass Radio Show is tonight from 7:00 to 8:00 PM. Coach Whipple will be there. Although the press release does not explicitly say so, in the past WEEI Springfield has streamed the audio from the radio show. Matty Vautour looks at what it will take for the Minutemen to be successful in 2016. The 2015 Minutemen team was not as good at the 2014 squad. UMass needs better kicking, better offensive line play and better Red Zone results to be competitive in 2016. We'll see how it shakes out. SEC Country has an article well worth reading about Whipple's connection with Gator coach Jim McElain. Talks about recruiting in talent-rich Florida and the fact UMass is open to playing more games in the Sunshine State. Fox sports previews the UMass-Florida game. Campus Insiders says Whipple has the Minutemen practicing a silent count to cope with the noise at the Swamp. Sam the Minuteman visits the Today Show---brings food. Amherst native Taj-Amir Torres talks about BC's trip to Ireland to play Georgia Tech. A Georgia Tech blog has BC coach Steve Addazio talking about the 2016 version of the Eagles. CBS Sports says Tajae Sharpe is the fantasy player you must have. UMass has their game notes for Florida up. Monday news from the Gators. Antonio Callaway, the SEC's leading receiver, has been cleared to play against UMass. The Gators two-deep for UMass. The Miami Herald says the Gators are ready to have a good time. Florida HC Jim MeElwain comments on the UMass game. CBS Sports previews the UMass-Florida game. Requires Adobe Flash player. UMass opens as a 37 point underdog to Florida. Dan Malone has the Minutemen's first official two-deep of the season. Bilal Allay and Raquan Thomas make the offense's two-deep. Jake Largay is listed as the starter at RG. Isaiah Rogers and Bakhari Goodson make the defensive backfield's two-deep as freshmen and James Bowie at LB. Mike Caggiano is listed as the kicker. Dan has notes about the two-deep. As Dan says, I expect a lot more rotation than listed especially on defense. If healthy, I would expect the all the JUCO's to play. Matty Vautour has a post on the Minutemen's new two-deep. Mike Traini of "Fight Massachusetts" previews the 2016 UMass season. Former UMass player Jordan Fiske joins the Minutemen strength and conditioning staff. Randall Jette was cut by the Packers. Marken Michel also likely to be released. The Boston College blog "Eagle in Atlanta" looks at BC's season and predicts a win over UMass. Florida is doing a Giga-pixel 360 degree fan image. For the luckey Minutemen fans going to the Swamp. You can sign up here to tag yourself on the image. More on the Gators activities for the UMass game including the panorama cam here. Florida is ready to unveil a revamped offense. Mississippi State blog "For Whom the Cowbell Tolls" predicts Florida over UMass 27-3. The Boston Globe highlights UMass QB Ross Comis. Maine opens with a Thursday night game against UConn. Mentions Liam Coan as the Black Bears new offensive coordinator. This article about Cedar Cliff football mentions UMass transfers Adam Breneman and Andrew Ford. CBS Sports says Victor Cruz looks like his old self. More on Tajae Sharpe's 60-yard catch against the Raiders. The Lincoln Journal-Star has Marquis Young among "players-to-watch" in their Independents league review. The Clarion-Ledger previews Mississippi State season. Jacksonville.com says UMass will provide a confidence booster for Luke Del Rio. The Daily Press previews Old Dominion's schedule. The Knoxville News profiles former UMass assistant coach Bob Shoop. Mentions UMass and Don Brown. The Salt Lake Tribune previews the BYU Cougars. Cal cruised by Hawaii 51-31 in Australia to open the 2016 college football season. NFLcom has Tajae Sharpe's big catch against Oakland. Fan Sided asks if Sharpe can lead all rookie WR's. Victor Cruz makes his first catch in 685 days. 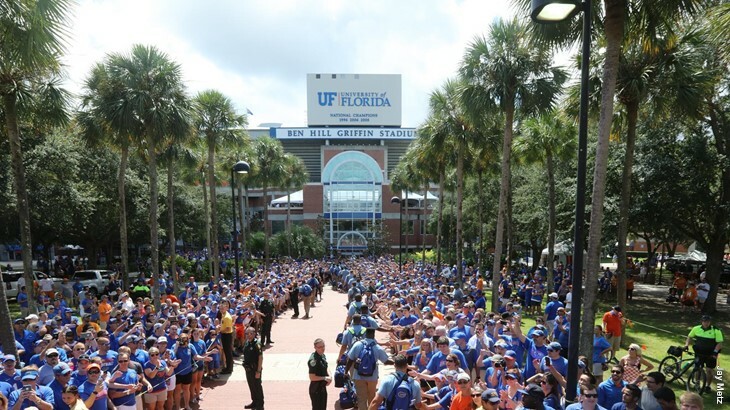 One week to the Swamp! UMass announces TV coverage for six home games plus @ Florida and @ ODU. Matty Vautour reports James Allen hopes to prove to the Gators they made a mistake by not offering to him. The Gators begin working on a game plan for UMass. The status of three Florida receivers is still unclear. The SEC Network predicts Florida's season game by game. A New Orleans writer looks at Tulane's season and as usual, predicts a win over UMass. BC Interruption looks at the potential two-deep for the Eagles. Tajae Sharpe on adjusting to the NFL. The NFL Network replays the Packers-49ers game today at 4:30. Set your DVR to check on Randall Jette. All the NFL Network games schedule here. Mic'd up with UMass defensive coordinator Tom Masella. His UMass bio. Jake Largay and Raquan Thomas in the OL. Isaiah Rogers in the defensive secondary. Dan has a post on QB Andrew Ford is feeling more comfortable. Ford probably doesn't know the offense that well at this stage in his career at UMass. Still think he's going make a strong bid to start sometime down the line. Suspended Gator players Teez Tabor and C'yontai Lewis won't play against UMass. Formerly suspended Gator WR Antonio Callaway thinks he'll be playing in the season opener against the Minutemen. UMass plays one of the Group-of-Five's best teams when they tangle with Louisana Tech later this year. USA Today looks at the Bull Dog's floor and ceiling for the 2016 season. The writer expects a blowout win against the Minutemen. Tech gets a DB transfer from Oregon State who can play right away. Victor Cruz is ready to play against the Jets. It'll be Cruz's first game action in 685 days. Iowa's Chris Doyle is now the highest-paid strength coach in the country at $595,000 a year. UMass' coach Connolly probably doesn't make that much. Need some motivation today? Check out Navy Football's pump-up video. UMass has a 2016 Press Guide here. It's a .pdf download. Staples or Kinkos will print it out and bind in spiral format for about $10 or so. The first UMass football luncheon will be held on August 31st. There will also be a Pep Rally at the Boston Harbor Hotel on Friday September 9th, which is the day before the Boston College game. Dan Malone has a post on James Allen, the player formerly known as James Oliphant. UMass needs all the defensive help it can get, so Allen's resurgence would help. His kick returns would also help to give the offensive a shorter field. Allen went 34-785 23.1 AVE 1 TD 97 LONG in 2015. Matty Vautour has a story about Jackson Porter returning to the defensive backfield. The Sentinel & Enterprise has a story about UMass featuring DL coach Matt Dawson. SEC Country mentions Ross Comis being named starter for the Florida game. The Gators will start working on their game plan for UMass today. The Montgomery Advisor looks at South Carolina. Victor Cruz is looking better at camp. 247Sports remembers when a undrafted free agent had a breakout game against the Jets. 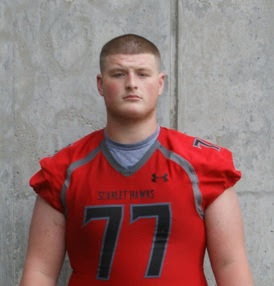 Back on June 22nd, I blogged about Justin Johnson, a 6-6 330 pound OL from Inhotep Charter School in PA.
Mike Traini has a post on Johnson updating his recruiting. Dan Malone reports Ross Comis will start against the Gators. Matty Vautour has a post featuring UMass center Fabian Hoeller and also training camp news. Matty reports Whipple has praised TE transfer Adam Breneman and also said true freshman Raquan Thomas won't redshirt. Matty also reports Jalen Williams will make the Florida trip despite not practicing so far in camp. Bernard Davis and Shakur Nesmith will start. Also making the travel squad are WR's Andy Isabella, Sadiq Palmer, Dan Jonah and Conner Lemieux. The Sentinel & Enterprise features UMass receiver Conner Lemieux. ESPN Gainsville says the Gators are gaining ground in camp. QB Luke Del Rio will be the first former walk-on to start for the Gators in almost 20 years. The BC Blog "BC Interruption" looks at the Eagles defense including new defensive coordinator (and former UMass HC) Jimmie Reid. News Oklahoma says UConn's athletic budget sets it apart from other Big 12 suitors. Hey, it's 48 degrees here in Jaffrey this morning! Feels like Fall. Feels like football! Video is UMass cadence. Turn your computer speakers all the way up. Let's do the bad news first, Austin Whipple was arrested for DWI Saturday night. Mike Traini of Fight Massachusetts reacts. Don't drink and drive. It's a tragedy waiting to happen. Not to mention the Globe will love something like this. Matty Vautour says JUCO transfer could make an impact with the UMass defense this fall. This is a smart move on the part of Whipple and staff. The UMass "D" got the short end of the recruiting numbers for the first couple of years in FBS. Not to mention of the six FBS games we've won, five were due to outstanding defensive efforts. The Minutemen need to fill deficiencies in the roster with JUCO's and transfers. That's just a fact of life for our program at this stage. Ali Ali-Musa and Tedrick Lowery are sure starters. Linebackers Rod Jones and Colbert Calhoun should be in the rotation. Davone Hall at 6-2 330 gives UMass some much needed size on the DL. Jordan Hamilton was good enough to get an offer from Air Force. Dan Malone has a post on the rebuilt Minutemen offensive line. I thought the OL underperformed last year. With five Power Five teams on this year's schedule, a better running game would sure help. Tajae Sharpe has graded out as the top NFL rookie so far in camp. Marcus Mariota says Sharpe makes it easy on the quarterback. iSportsweb.com reports the Titans had a Sharpe take on their game with the Panthers. The Florida Gators open at #25 in the preseason AP poll. Austin Burton, a QB from Newton South, who had a UMass offer has flipped his commitment from Boston College to UCLA. Hawaii and Cal prepare for kickoff in Australia this Friday. Matty Vautour looks at competition to make the traveling squad among the UMass running backs. The Minutemen went into Spring ball with only two scholarship RB's: Marquis Young and Sekai Lindsay. IMHO, that means at least one and possibly both freshmen RB's Bilal Ally and Peytton Picket are a virtual lock to see some significant carries in 2016. John Robinson-Woodget is the starting FB. Whipple likes to see the FB catch the ball out of the backfield, but rarely calls a running play that position. Andrew Libby will probably back up Robinson-Woodget at FB. For some incoherent writing, read this write-up on UMass-South Carolina. The Orlando Sentinel says it'll be running backs by committee for the Gators. 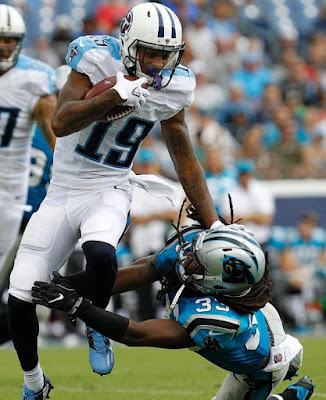 Matty Vautour report Tajae Sharpe is playing like a veteran for Tennessee. CBS Sports says Sharpe is a phenomenal fantasy football late-round sleeper. Yahoo Sports reports the Titans looked Sharpe against the Panthers. 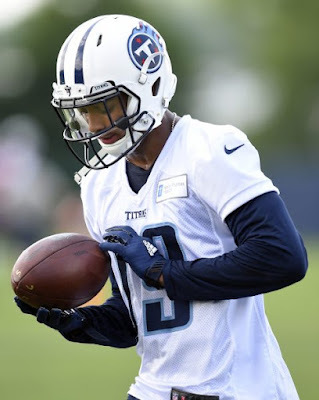 The Nashville Post says Sharpe looks to redefine the rookie standards for the Titans. 247 Sports has a post that says Sharpe isn't playing like a rookie. Victor Cruz returns to practice today. Watched the Ravens-Colts game last night. Vladimir Ducasse was playing RG for Baltimore. Ducasse started 6 games for Chicago last year and the Bears won five of the six. Ducasse is in his seventh year in the NFL. Inquisitr.com says Tajae Sharpe is one of the top-five fantasy football picks. The Tennessean reports Marcus Mariota and Tajae Sharpe look like old pros. Sharpe caught all six passes thrown to him against Panthers. If you're only going to read one of these links, read Tajae Sharpe looks like a real gem for the Titans. Pilot Online says Old Dominion will have hustle to keep their sellout streak going for the UMass and FIU games on October 8th and November 26th respectively. Sports on Earth previews the FBS independents and predicts UMass will go 2-10. SEC Country reports analysts are saying Florida's D-line is the best in the SEC, but the Gators want to be the best in the nation. BC holds final scrimmage of fall camp and starts to prepare for Georgia Tech. UMass has a practice at Gillette. They then hit the beach for a cookout. How Luke Del Rio became the starting QB for the Gators. Florida coach Jim McElwain embraces the chaos that has been the Gators training camp. Fan Sided previews the 2016 Boston College Eagles. BC WR Elijah Robinson hopes to add a vertical dimension to BC's offense. Campus Insiders looks at every game of the Eagles' schedule and predicts a "blowout" win over the Minutemen. Eagles 2016 hype video above. Iowa State's president says the Big 12's expansion decision may take longer than anticipated. CBS Sports ranks the top-ten suitors for Big 10 membership. Dan Malone has a post on UMass kickers Logan Laurant and Mike Caggino. Laurant and Caggiano's bios here and here. Kicking is another facet of UMass football that Minutemen fans hope has turned the corner in 2016. We would have won at least four more games in our FBS era with better kicking. Look at last year. UMass had top-25 Temple on the ropes and ended up losing. That would have been a huge win for the program. Let's hope those days are behind us. Matty Vautour has a report on changes to the Minutemen offensive line. Tyshon Henderson has left the program and Lucas Kotler will have foot surgery, which will sideline Kotler for the season. Also available are Derek Dumais, Joe Parsons, Dan DiNicola and Jake Largay. Whipple mentioned Driscoll as a starter during the Town Meeting last week. He also said freshman Raquan Thomas (6-5 392) was so big they haven't been able to find knee braces large enough to fit him. Whipple said they would like Thomas to lose about 25 pounds, which would bring him down to a svelte 360 or so. The Florida Gators name Jack Del Rio as starting QB for the UMass game. A Daily Herald writer predicts the UMass-BYU game as Cougars 48 UMass 9. Whipple, when asked how summer training camp was going responded, with 100+ players on camp, there was always a brush fire somewhere. I think if you compared the behavior of the football players to 100+ random UMass male students, I believe the football players would compare favorably. However, it's truly amazin' how creative some people manage to be in screwing up. South Carolina punter Sean Kelly was arrested for "malicious destruction of a tree". OT, but Dennis Eckersley should come with sub-titles. Some Media Day images from the Athletic Dept. Mark Whipple proud of Tajae Sharpe's transition to the NFL. Dan reports Marquis Young is ready to lead the UMass RB contingent. He says UMass wants JUCO transfer Rod Jones to rush the passer. Dan also reports Infinite Tucker will not attend UMass as he has switched to track. Patrick Volcy and Antoine Webster will grayshirt. T.J. Rayam and Tyler Thompson will attend prep school. That breaks their verbal and they can sign with another school. Thompson and Tucker were three-star recruits. T.J. Rayam was two star. Matty Vautour has a post on Logan Laurent competition with Mike Caggiano to be starting kicker. Florida HC Jim McElwain has suspended two starters for the UMass game due to a training camp fight. Teez Tabor's Florida bio. C'Yontai Lewis' bio. BC football and QB transfer Patrick Towles try to put the 2015 season behind them. I've blogged about Pat Freiermuth, a 6-5 225 pound TE from North Andover a number of times before. He recently verbaled to Penn State. Freiermuth had offers from UMass, BC, Syracuse and other Northeast schools. UMass OL Coach Mike Foley is his uncle. Ali Ali-Musa has fun with UMass Media Day. Matty Vautour has a story about Khary Baily-Smith and his return from last year's knee injury. Kevin Dillon of MassLive has a post on the Titans trading Dorial Green-Beckham to the Eagles, a move that certainly opens a spot for Tajae Sharpe. CBS Sports says Tajae Sharpe is expected to start immediately. Eagles' fans are not thrilled. Old Dominion announces a 6:00 PM start time for the UMass game. TV coverage by C-CUSA TV. UMass fans can subscribe for a one-day pass to C-USA TV for $6.95. The President of Old Dominion announces the approval of a $55 million upgrade to the Monarchs' stadium. The Florida Gators may announce their starting QB this Friday. The BYU offense has been practicing a number of offense sets. Sporting News says the Big 12 expansion begins with BYU, Cincinnati and Houston. Promoters expect 65,000 at Olympic Stadium in Sydney, Australia for an american football game between Hawaii and Cal. New NFL Bag policy will apply for the UMass games being played at Gillette. Matty Vautour has a post on the UMass receiving corps. As I stated on Monday, one of the most impressive sights at Saturday's scrimmage was the receivers. They were catching everything. Almost no drops the whole evening. UMass gets Bernard Davis back from a redshirt. Jalen Williams has been limited with an injury. Shakur Nesmith has been inconsistent. When Whipple showed some film from previous practices, one of the clips was a DB intercepting a ball in the end zone. That was against Nesmith. The DB went up for the ball and Nesmith didn't. Whipple has praised Andy Isabella as improving his pass catching skills. Isabella played last year and had a number of drops. Freshman Sadiq Palmer and Elijah Robinson are in the mix and I think one or both won't redshirt. Brennon Dingle is an academic redshirt and will not play in 2016. It's not his grades as I think Whipple said Dingle was missing one class for academic qualification. Watch Sadiq Palmer go up for a pass in Saturday's scrimmage. For troubled Gator WR Antonio Callaway, the wheels go round and round. Fan Sided says UMass and Western Carolina are the only certain wins in 2016 for South Carolina . Don Brown is adding lots of wrinkles to Michigan's defense. The Tennessean has five questions with Tajae Sharpe. Sharpe is back on the practice field after being evaluated for a concussion. BC Interruption says the Eagles offense is improving. SB Nation evaluates Mississippi State's 2016 status. I've blogged about Hunter Long, a 6-4 250 TE from Exeter, NH a number of times before. He verbaled to Boston College over the weekend. Long attended last week's Clam Bake at UMass. Also had an offer from UConn. Matty Vautour has a report from Saturday's scrimmage. All right UMass fans, this is just one man's opinion, but I think this is the most talented UMass team to ever play in Amherst. Keep in mind that it won't make any difference against the Power Five teams on our schedule, but after viewing Saturday's scrimmage, I think the Minutemen will be competitive in all their other games. First off is Andrew Ford. He flat out looked like a FBS QB. Despite only being with the team for a few weeks, he'll be tough not to start. Whipple said Ford had a better arm than they expected and he showed it Saturday. He made a lot of good throws. He looked accurate and strong. In fact all the QB's looked good. Comis is a good dual-threat guy and Randall West, working at the end of the scrimmage dropped a beautiful throw into the right endzone far corner. In addition, everybody caught the ball. The ball hit the turf only a couple of times all night. Travis Reynolds, Brennon Dingle, Shadiq Plamer and Elijah Robinson looked fast and showed good hands. I liked the running of Payton Pickett and Bilal Ally. In addition, the defense was closing to the ball and popped pads all scrimmage. I think UMass finally has enough athletes to run some packages. The JUCO players are going to give the Minutemen more depth on defense. The difference from the Spring game was night and day. Prior to the scrimmage Whipple showed a video of previous practices. The new players were animated and looked as if they were having fun. After making a play they mob the player involved. I think the 2016 recruiting class is going to be remembered as the group that changed the football culture at UMass. Gator RB Mark Thompson sets a goal of rushing for 1,000 yards ----in his first seven games. He would need to average 142 yards a game to do that. We havn't talked much about the Wagner Seahawks. They've opened camp. The Seahawks 2016 prospectus (a .pdf download). The Seahawks have a lot of players. Their roster runs three single-spaced pages. The Tennessean says Tajae Sharpe avoided a concussion. The NY Post report Victor Cruz isn't getting better. If the AAC loses a team (or teams) Middle Tennessee State wants join the league. I went to the Season Ticket holders town meeting last night. We met with Whipple, had a tour of the Performance Center and watched a spirited UMass practice that lasted over two hours. Whipple praised Andy Isabella as a much improved receiver and felt Isabella would give us a deep receiver threat. Of the redshirt freshman, he said Jack Driscoll was going to start on the OL. Whipple that the coaching staff was upwardly surprised by the strength of Andrew Ford's arm. He said TE transfer Adam Breneman has been healthy and would likely start. He was pleased with Sekai Lindsay and Marquis Young. Whipple also said FR RB Bilal Ally was running well in practice. On defense, Whipple said Shane Huber and Steve Casali were both up to about 240. He also likes the JUCO's that joined this supper. Whipple said the UMass coaching staff made a concerted recruiting effort for defensive linemen, but DL's are scarce. He said the defensive staff sent him a list of D-lineman they wanted to offer and he didn't think any of them were good enough to play in Amherst. All five ended up getting Power Five offers. He said it shows how competitive recruiting DL's really is. Whipple said All-American JUCO Rod Jones arrived out of shape. Whipple thought the return of Khary Bailey-Smith would be a good help to the young Minutemen defensive secondary. He said Travis Reynolds could be the back up punter, kicking Australian Rugby style. I'll have more on the practice and some images in tomorrow's blog post. Howard Herman of the Berkshire Eagle has a post on the Ford-Comis competition. The Salt Lake Tribune has a feature on UMass going Independent. Underdog Dynasty says UMass is a must win game for FIU and the Panthers "unquestionably" have more talent than the Minutemen. Boston College hopes new players will turn the Eagles fortunes around. Mississippi State's coach Dan Mullen feels the Bulldogs have a lot of work to do. Tajae Sharpe is being evaluated for a concussion after the Titans first preseason game. Victor Cruz returns to practice after suffering a groin pull. Mike Traini has a post on Riley Burns, a 6-4 290 pound OL from Milford, MA. Northeast Gridiron has a profile of Burns here. Receiving interest from Rutgers and BC . Matty Vautour has a post on Minutemen TE's for 2016. Playing are Penn State transfer Adam Breneman , former QB Todd Stafford, Australian import Travis Reynolds, Shaquille Harris (6-62 in 2015) as well as true freshmen Cody Banks, Avien Peah and Cole Morrison. Both Taylor Edwards and Kyle Horn are out for the season with knee injuries. I've blogged about former UMass player Tom Gilson a number of times before. Boston Sports Barrage says Gilson is a star in the making. Former UMass RB Lorenzo Woodley is playing for the Minnesota Mavericks. Florida hopes for less drama and more offense in 2016. The Gators best WR is cleared on title IX sexual assault and will be eligible to play against UMass. All coaches need something to get after their team for. In the Gators case, it was an "unacceptable" practice. The SEC Network add sideline reporters for games including UMass at Florida. Dan Malone reports Whipple is managing reps for Ross Comis and Andrew Ford. He says Randall West has moved into the #3 slot. Nice story well worth reading about Andy McClay, the UMass punter who walked on to UMass' 1998 Final Four hoops team. I think he's still the only player to be on a National Championship football team and a Final Four basketball team in the same season. BC Interruption says the Eagles will continue to play FCS teams. A top Detroit recruit likes former UMass coaches Brian Smith and Don Brown at Michigan. CBS Sports thinks Mississippi State won't be bowl-eligible in 2016. Titans coach Mike Mularkey praises Tajae Sharpe. CBS Sports reports Sharpe continues to work with the Titans first string. Titans QB Marcus Mariotta says Sharpe has been "killing it in camp". Steve Spurrier watches the Gators practice. Includes video from Florida's camp. ESPN says BYU and Houston would make the Big 12's athletics better. 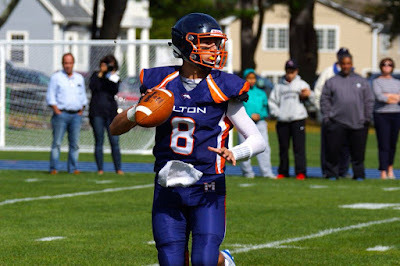 Several recruiting services indicate UMass is interested in Alec Beesmer, a 6-2 185 pound Pro-Style QB from Kingston, NY. Dan Traini has a post featuring Beesmer. Also interested are Syarcuse, UConn, Old Dominion and Rutgers. I've blogged about Claudin Cherelus, a 6-0 200 pound Safety from Golden Gate HS in Florida a couple of times before. He recently verbaled to Minnesota. Chose the Gophers over UMass and Northern Illinois. The DL's run agility drills. Dan Malone has a post on the return of Khari Bailey-Smith to the UMass secondary. The Minutemen could have used Bailey-Smith's play making and leadership last year. With a lot of new faces in the defensive secondary, he'll make a difference this year. Penn Live has a post about Adam Breneman returning to football and why he chose UMass. Roll Bama Roll looks at Mississippi State's schedule. Former UMass offensive coordinator Brian Picucci joins the Maine staff as RB coach. You remember Liam Coan is offensive coordinator there. Marshal has adopted the "Guardian" caps UMass wears during practice. The Florida Gators are expecting another big season. ESPN reports the Florida State's Attorney says there is not enough evidence to charge two Gator players. Odell Beckham keeps encouraging Victor Cruz on his comeback bid. Dan Malone has a very early look at projected starters. In 2016 the Minutemen signed their best ever recruiting class. There is just too much talent for some of them to be redshirted. At RB, UMass only had two scholarship RB's on the roster. I expect one or both of Peytton Pickett and Bilal Ally to play this year. At WR once we get beyond Jalen Williams and Shakur Nesmith, things look iffy. I would expect three-star recruits Brennon Dingle and Sadiq Palmer to get long looks. TE was and is a talent hole in the Minutemen roster. Hopefully Penn State transfer Adam Breneman has some gas left in his tank, but true freshman Cody Banks and Avien Peah, both three star recruits have too much talent to sit. Adam Aucoin of the Daily Collegian reports UMass looks for a balanced rushing attack this year. New to the mix is Domenico Cipriani a 6-4 270 DL form IMG Academy Football. Hudl.com has video on Cipriani. Andrew Cyr of the UMass Daily Collegian says UMass adds size and depth for 2016. Mike Traini has a post on Rod Jones joining the Minutemen and has some information on the other JUCO defensive players. Dan has a post on Penn State transfer Adam Breneman. If he can stay healthy, it'll be a big boost to the Minutemen. Matty Vautour has a report on Sekai Lindsay and also mention freshman RB's Peytton Picket and Bilal Ally. BC Interruption interviews Mike Traini on the state of the 2016 Minutemen. BC Interruption also does a preview of UMass. The Tennessean has a bunch of images of Tajae Sharpe from the Titans camp. The Columbia Daily Herald says Sharpe made two excellent plays in yesterday's camp. Victor Cruz may not play in the Giants first preseason game due to "groin tightness". Georgia Tech's Mike Bobinski seems to leaving for Purdue. Would the Wreck's make a run at Ryan Bamford? UMass could not match their finances. 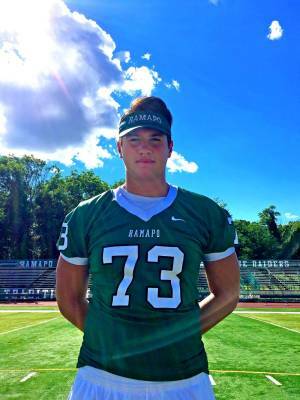 Several recruiting services indicate UMass has offered to Chris DiTommaso, 6-4 250 pound DL from Franklin Lakes, NJ. Has FBS offers from UMass and Temple. Howard Herman of the Berkshire Eagle covers the Minutemen's first day of practice. Dan Malone has a report from the first day of practice and says Ross Comis is #1 so far. 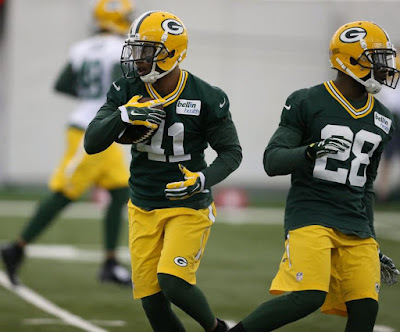 Malone has a photo gallery from the first practice. Matty Vautour reports from the practice. He notes Sekai Lindsay and Khari Bailey-Smith are healthy. He also says true freshman Taylor Edwards will not play in 2016 due to a injury and Jon Lucier went down with an injury in the first practice. 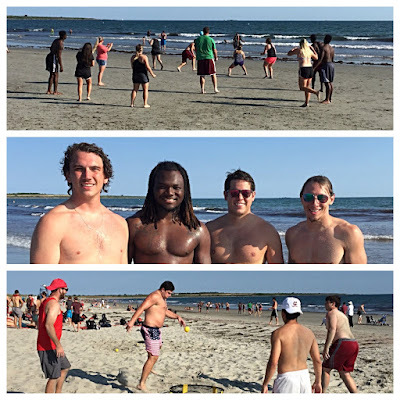 John Connolly of the Boston Herald has a post on the first practice. Andrew Cyr of the UMass Daily Collegian says Comis and Andrew Ford are close. The Ralphie Report has rule changes for the 2016 season. Mostly concerns the targeting rule. Antonio Callaway is still in limbo for the Gators opener against UMass. The Gators, like UMass, are seeking a new QB. Besides catching passes, Tajae Sharpe is field kicks and punts. USA Today previews the ACC and ranks BC last in the Coastal Division and has no Eagles in the preseason All-Conference team.